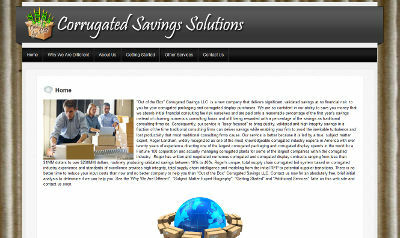 BsnTech Networks has now completed the website for “Out of the Box” Corrugated Savings, LLC. Roger had spoke with us a few weeks back about his need for our full range of services – website hosting, domain name management, website design, and logo design. Our graphic designer completed the logo a couple of days ago and just released the logo to Roger late last night. It was then added to his website – and therefore that was the final item needed to complete the site. Roger was very prompt with providing us everything he wanted on the site – the page titles, the pictures that he wanted on each page, and the text for each page. He also provided us a couple of different websites that he liked. By doing so, we had the majority of his site completed in just a few days. We appreciate the business from Roger and hope that if there are any other website or graphic design services he needs, he’ll contact us! Roger’s website is at corrugatedsavings.com.